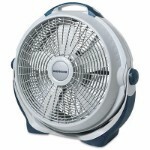 In the Picture : Vornado Floor Fan – Click here for more information. Cheap and simple, a floor fan is the companion to stay cool in the long summer days. 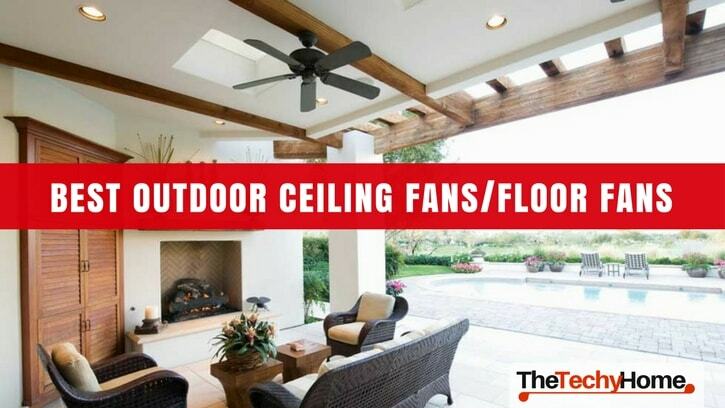 There are many reasons why people would look for the best floor fan out there. Maybe the air conditioner isn’t enough to keep the heat off the space you like to be in. The chill effect that make you feel cool and as if flying may also be a reason. Or you want simply promote air circulation inside your home. 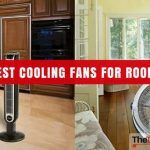 Whatever the reason is and because finding the best floor fan in the market requires research here and there, I wrote this article so that you can find information and customers opinions about various floor fans in one place. 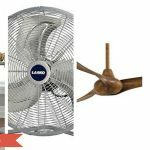 What to Look For to Pick the Best Floor Fan ? Being lightweight is one of the aspects to look for when considering a floor fan. 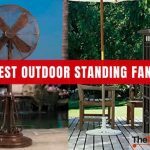 These fans are meant to be portable so that you can move them into any part of your home to cool. The second aspect is airflow power. If the room you want to bring the breeze in is large, then the floor fan should be strong enough to circulate the air at a wider range in order to displace the heat of the entire area. Also, the best floor fan would have an easy to remove grille so that you can clean it easily from household dust. 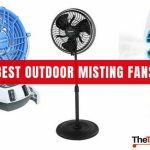 CFM, which is the cubic feet of air that a portable fan can move per minute, is also another evaluation point you should be looking at especially if you have a big space to cool. A good rate would be 1000 CFM or higher to ensure you have a great cooling experience. A low CFM rate is not at all an indication of poor floor fan, but it would be adequate for small rooms. Also called Turbo Force Room Air Circulator, the Honeywell HT-908 is in the top of our list today and is also a “Best Seller” on Amazon in the Floor Fans category. Honeywell is a company that requires no introducing and which is proud to announce that this model is 30% quieter than leading competition because of the design of its 3 blades. 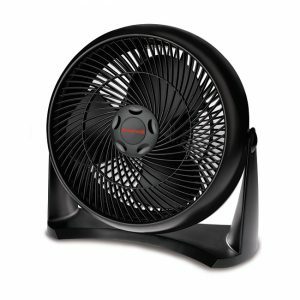 The Honeywell HT-908 features an aerodynamic turbo design to provide you with powerful whole room cooling with not much noise.The fan’s head can pivot up to a 90 degree angle as you can expect from the look of it. You can use is either to provide you with direct cooling or as an air circulator especially if you plan to use it with an AC. It features 3 speeds settings and a removable grille for easy cleaning. The fan weighs 5.7 pounds. The Honeywell HT-908 can also serve as a table fan. It is available in white color and you can choose between the 11 inch and the 15 inch model. 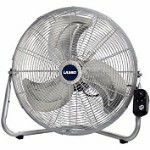 This Lasko fan has a received a very high rating from customers (4.5 out of 5 stars) and very positive reviews. 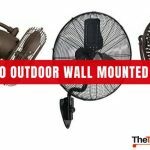 It’s a high velocity floor fan that you can also use as a wall mount fan. It has a “Quickmount” wall mount system that makes it very easy for you to move from floor to wall. You can also direct the airflow as it has a pivoting head. The Lasko 2265QM features the standard 3 speeds settings and rubber pads to protect floors and surfaces from damage. A pretty classic tubular steel construction design with three nice silver metal fan blades that will refresh your hot days very nicely. You can also use this Lasko floor fan in other things like directing it onto you equipment if you run a computer regularly or a gaming console. This Patton design its fan to endure rugged environments and the this High Velocity fan is one of these. 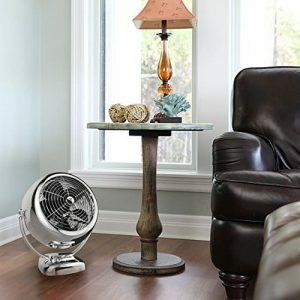 The durable metal with which this fan is made makes it an airflow manager that you can use both in your home and your work environment, for cooling or for drying. It has a tilt-adjustable head enabling you to focus airflow where you wish to . Like all floor fans of this kind, it has 3 speed settings and a carry handle. As an important reminder here, this fan has wide grills which means that if you have children it could be dangerous as they can get their little fingers in and get injured. The Patton PUF2010B-BM weighs 15.1 pounds and is available in White color and three sizes, the 14, 18 and 20 inch fan. Withe more than 722 customer reviews, this model is rated 4.3 out of 5 stars on Amazon. This is a powerful high velocity fan from Lasko which looks the Ferrari of floor fans. The first thing that sets it apart form other fans of the category its design. Its rugged carry handle indicates a great sense of solid manufacturing. The Stanley 655704 is indeed made for environments where resistance and durability is needed, in other words : shops. This powerful floor fan is designed to give strong breezes in both indoor and outdoor environments especially in tight places where fresh air is needed. In addition to that, it has a full-range pivoting head which makes a great multi-purpose floor fan. 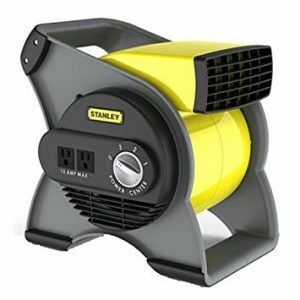 The Stanley has interesting features like the a circuit breaker with re-set button, a two 120 volt grounded outlets for accessory use in addition to the standard three speeds. You can also use this floor fan to dry floors, carpets and furniture. 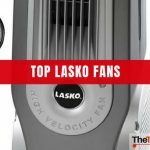 The Lasko 3300 is a large floor fan meant to deliver a powerful airflow but it requires a bigger space than regular fans as it measures 20 approximately. If you don’t have an ample floor space, you can put it on your window. But again the window should at least measure 28 inches, so you should measure it before deciding on this one. It is fully Assembled and has an large, easy to use carry handle. It has a head with adjusters on the sides that allows you to direct the airflow to other areas like blowing air straight up to circulate the air through the room. It is a little bit loud especially on the high speed settings.The design of this fan is pretty simple with five blades, nothing fancy. The speeds settings button placement is another thing I don’t like on this fan as it’s positioned in the center and the numbers on it are not easy to see, especially in dark rooms. Click here to view pricing on Amazon and find a great deal. 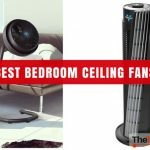 As I’ve mentioned earlier, floor fans are cheaper and simpler to use than other types of fans like ceiling fans which requires installation, are immobile and costy. On average, floor fans cost between $15-$30. Other more elaborate models which include a timer, noise control and other features cost a bit more dollars. However, if you have kids a floor fan is not the best idea. Most of the time, floor fans have large grills gaps which could be dangerous if you have small children as they can enter their fingers in them easily. But in case you don’t have small kids, then a floor fan is a great device which will help you cool your room simulating being outside, in addition to the ability be transported anywhere in the house. Another reason to consider buying a floor fan is energy saving. Using a floor fan with an air conditioner would save you money as it will move the cold air around the room more efficiently. In order to create an optimal air circulation, the fan should be positioned in a specific place which is not possible with other types of fans. If you have sensitive ears, then a quiet fan is a must. The best floor fan should have a “quiet mode” designed to set the fan to run quietly while sleeping. 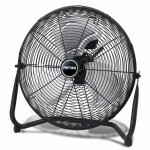 Many floor fans have variable speeds, most of the time 3 levels of speed and the lower one is meant to be a quiet mode. 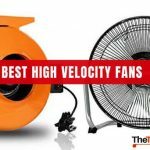 But many brands claim to have quiet fans, so it’s not easy to know which is the quieter, but you can always check the and see if the sound rating is less than 60 decibels as it’s a good rate when it comes to this type of fans. 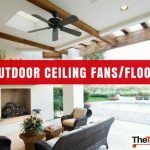 I think that after this small introduction, you’re more prepared to begin your journey towards finding the best floor fan for your home. 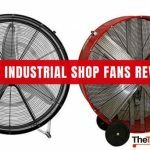 The short reviews bellow will serve you as a guide as they contain a concentrated summary of one of the best floor fans out there. If you need more information, I’ve included links to each fan’s page on Amazon where you can look for specifications and also customers reports and comments on the floor fan. 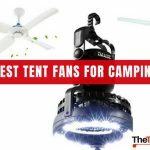 I hope these reviews helped you chose the best suitable floor fan to you and don’t forget to check the warranty coverage of the fan so that you choose a long term one. In case you’ve changed your mind and want to look for another type of fan, check our best fans guide to help you out. We reviewed 5 of the best floor of 2017 to help out pick the most suitable one for you.